My biggest makeup sin is that I never used makeup cleanser before. I know it’s a crime in makeupaholics’ world. I don’t wear much makeup on daily basis. I am done in minimal makeup – Kajal, face powder, lipstick. But even the minimalist of minimal should be cleansed properly. It’s a myth that usage of lot of makeup damages your skin. It depends greatly on quality of makeup used and moreover how well it was cleansed before you go to sleep. Lot of girls would not remove makeup properly and go to sleep. In my case I would use my regular cold cream or body lotion to remove makeup. I know lot of girls do the same. This post could be helpful for all to understand how makeup cleanser could be better over regular lotion or cream for makeup removal. So first time I got makeup cleanser. 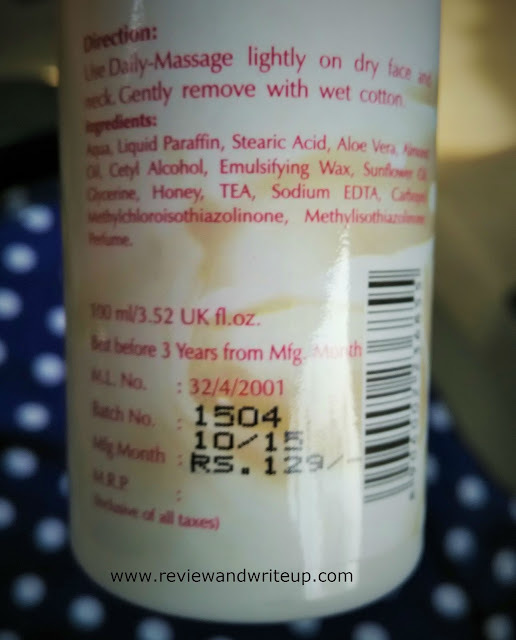 I have reviewed lot of Anherb Naturals products on my blog. 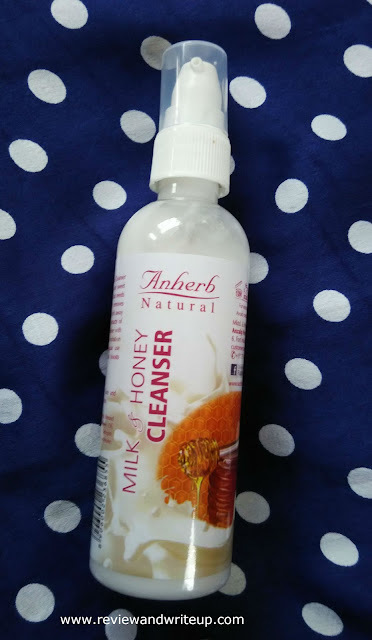 I was so happy with the brand that when I decided to buy a new cleanser I thought why not Anherb Natural Milk & Honey Cleanser. It’s super affordable at Rs. 150 for 100ml. Keep on reading to know whether it fared well or not. Packaging – Anherb cleanser is housed in a clear, sleek plastic bottle which has a pump attached to it. The hole of pump is tiny so only little quantity is squeezed out in one time which is really good. 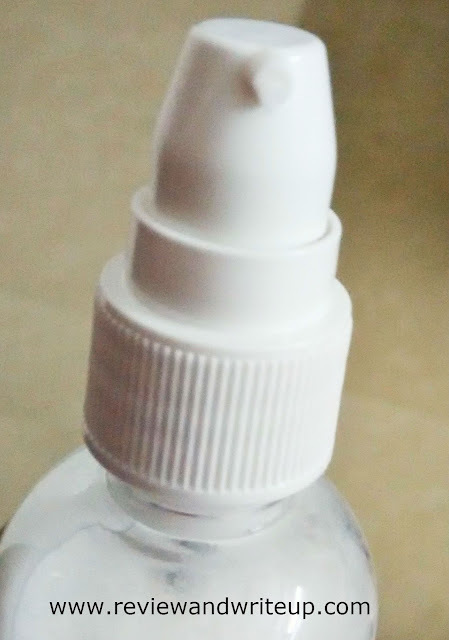 Sticker wrapped around bottle has all information written over it. Bottle looks really cute. Its travel friendly as well. Its light weight and will adjust easily in makeup pouch. Claims of Brand – Anherb Natural Milk & Honey Cleanser removes impurities, stubborn makeup and buffs away dry skin cells. Special botanical extracts of sweet almond and aloevera combine with milk & honey that improves skin hydration making it firm and vitalized. Regular use encourages cell regeneration and boosts complexion. 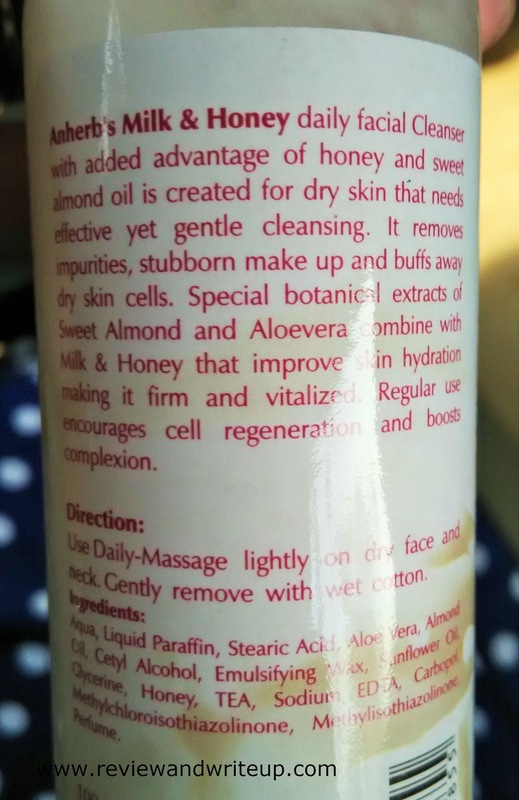 My experience – I was aware that this cleanser was a multi tasker. But I decided to use it for makeup cleansing only. After coming back home from work, I wash my face first using my facewash. After that I would take cotton and squeeze out Anherb cleanser and removes the remaining makeup. In one wipe my kajal, remaining face powder, lipstick would come off. I know you have a doubt here why would I use a cleanser after washing face with face wash. Reason is face wash is not capable of removing makeup perfectly. Even after washing face try to wipe out your face with cotton. You will see traces of makeup on cotton. That’s why we need cleanser. You know now that I was using normal cold cream or regular body lotion for cleansing. Earlier I had to struggle to wipe makeup. I had to literally scrub earlier especially for face powder and kajal. But using cleanser had make job so easier. In one stroke my makeup comes off. After removal of makeup I apply my cold cream and I am ready to go to bed. Brand suggests that you can also use it while massaging gently on skin and wipe off using cotton. This method is best for dry skin people. Also I had one myth that normally cleansers don’t have good smell. But this one proves me wrong. Anherb cleanser smells really good. It’s neither strong nor very light. Fragrance lingers on skin for some time. From my experience you know now that using cleanser is better than using regular lotion or cream for makeup removal. I am totally loving it. By the way I am using it from last one week and cleanser is white in color with creamy consistency. If you follow me on Instagram than you would know when I put it to test. R&W Recommendation – Are you also one of those creatures (which I was earlier) who would use cream, lotion for makeup removal then you definitely need one. If you are using an expensive makeup cleanser use a decently priced one as you need it for makeup removal only so why pay extra when you can get it done in less price. Haven't heard of this brand, but it definitely sounds amazing.